Yesterday I posted up about all the fun the thrill seekers could find on the rides at Cedar Point. Many folks commented on how scary the rides look, but today I want to tell you about all the fun those who don't want to brave the daring rides can have. You don't have to be a daredevil to enjoy a visit to the park. 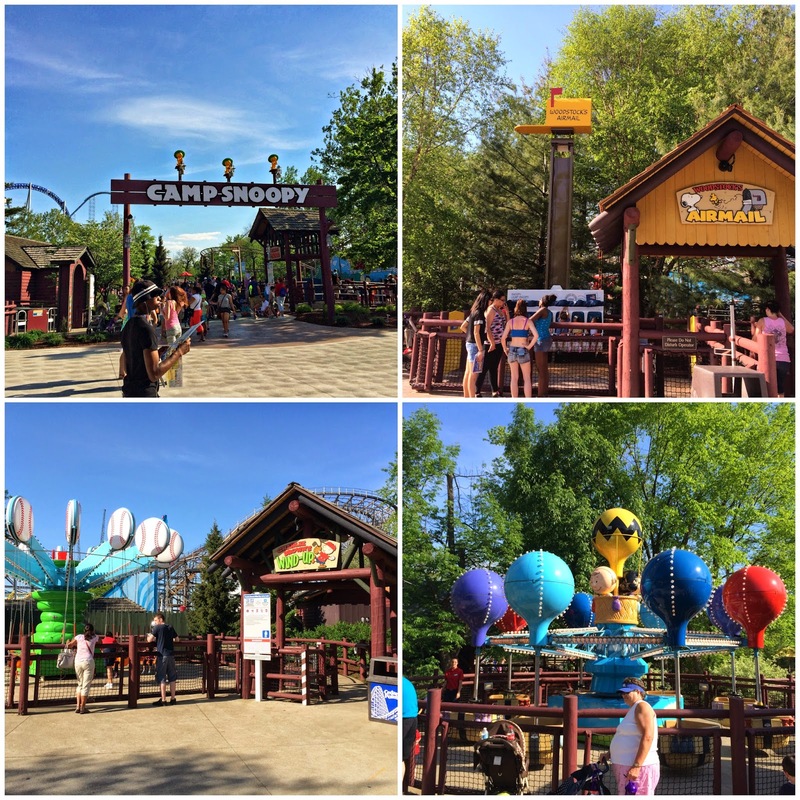 Young, old, or in between, there really is something for everyone at Cedar Point! Camp Snoopy is a great place for families to hang out, explore, and have fun! Here you will find many rides that are suitable for all ages! The Peanuts theme is so fun! Right around the corner from Camp Snoopy, hop on the old time cars and go for a little spin. I let Allison take the wheel so I could just sit and relax for a bit. If you aren't all that into the rides, that's alright! There are many attractions that are cool to explore! Dinosaurs Alive is a wonderful exhibit. Here you will get to explore the world of animatronic dinosaurs. Offering up over 40 different scientifically accurate dinosaurs, you will get a feel for how big these creatures really were. At some of the stops, there were devices that let the user push a button to control the dinosaur's movements. The whole exhibit took us about 30 minutes to get through, but could have been prolonged if the kids would have let me stop to read the information boards at each dino. This exhibit is an additional fee, running around $2.50 per person for the entrance, but I think it is totally worth it. Getting up close and personal with life like dinosaurs was an adventure all on its own! We also took a walk through the Town Hall Museum. Here we were able to spot some really neat antiques. 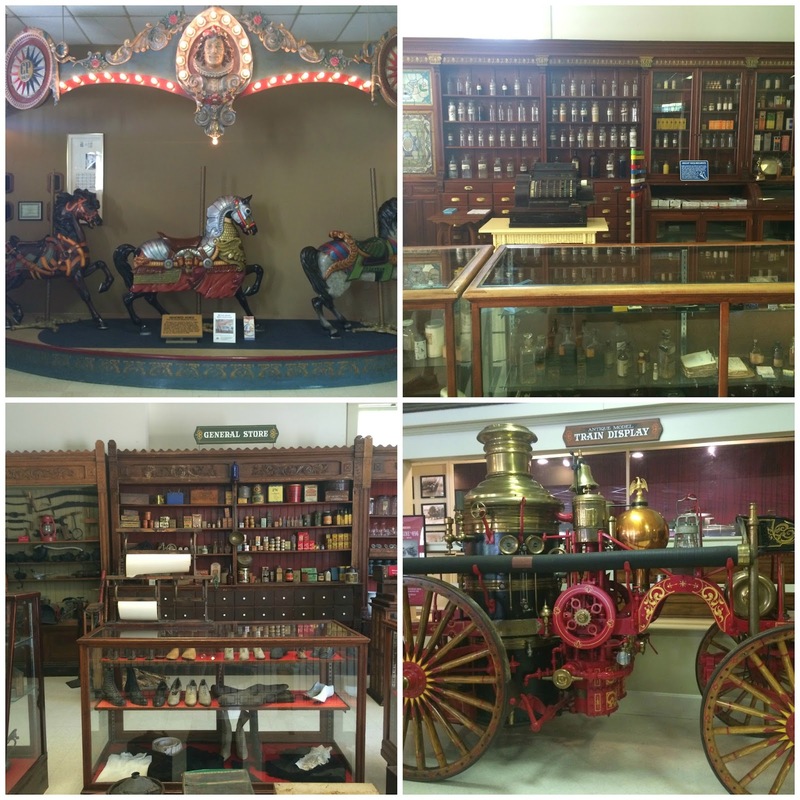 The kids loved the carousel, but I enjoyed looking at the old barber shop and pharmacy items they had on display! There is no admission fee to browse the museum. 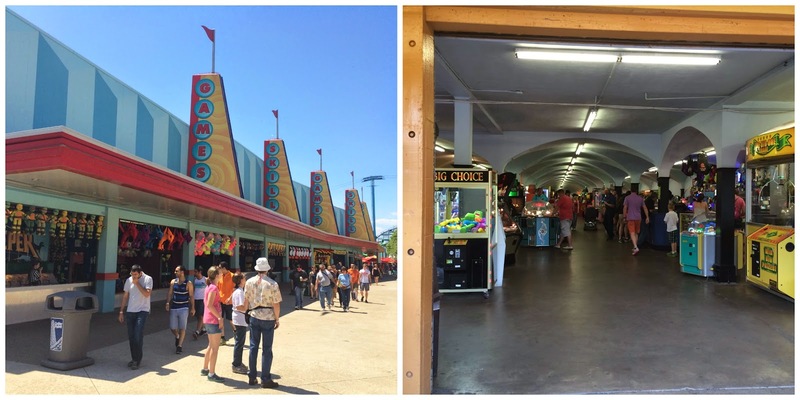 If you are into carnival and arcade games, Cedar Point has plenty! After walking the park, you do tend to get hungry. There are 37 different dining options, all with fantastic food! Not only do they have their own little fun food stops, like Charlie Brown's Cookout, but you can get national favorites like Auntie Anne's, Panda Express, and world famous Pink's Hot Dogs! We were treated to a buffet style lunch during our stay, and it was fabulous! We also made a few pit stops for ice cream throughout our 2 day stay. There is so much to do, see, and explore at Cedar Point. We stayed for 2 full days, and I think we could have packed more activities in if time permitted. I would like to suggest getting the Fast Lane wristbands if you want to have time to ride all the rides and explore the attractions. The bands do run around $70 each, but will get you front of the line access on most of the rides, where wait time is 15 minutes or less. We didn't get them on the first day, but did on day 2, and we had so much more fun since we didn't have to wait very long for the rides we wanted to go on. If you are looking to take the family on an adventure this summer, I highly recommend going to Cedar Point! Cedar Point is located in Sandusky, OH. If you would like to learn more about all of the fun rides at Cedar Point, be sure to visit the website, as well as stay up to date on current happenings by following them on Facebook and Twitter. *Disclosure- I received complimentary passes to the park, lunch, and tickets to Dinosaur's Alive in exchange for my honest review. The thoughts expressed here are strictly my own and have not been influenced by promotional items. My boys would have loved that arcade. We aren't big on rides, so it's nice when an amusement park caters to everyone like that. Love dinosaurs eggs and those horses too. And you looked gorgeous as usually and the miss junior and the future son in law looked cute together too! this theme park looks so huge!! I'd love to check out Camp Snoopy with Lil Pumpkin and I know my nephew will love the dino place! When my Daughter was younger, we used to go to Cedar Point a lot. Haven't been there since my Grandkids were small. Now I have some more Grandkids to take. Looks like fun, but it's a little far for us. We're headed to Hot Springs, Arkansas in July. Yes, wonderful, funny pictures, I love that beautiful theme park for the day! We have a Camp Snoopy in CA too! I didn't know, but should've assumed, it's elsewhere. I had a great time there with my nephew and his parents. Yours looks more impressive, especially the lunch buffet. We always talk about what a blast it would be to tour all the amusement parks in North America, just to ride the roller coasters! Looks like you guys had a fantastic time. This looks like a fun place to visit..the pics are great and you beam so I know you were having a great time. How fun! My nephew LOVES Peanuts. I know he'd be digging that top photo. Everyone in my family loves dinosaurs and history. It looks like a place we'd be totally into. And here I thought Cedar Point was just a park full of massive roller coasters. Look like a great place to bring the family! I would love to see the Dinosaurs alive so would my oldest son he loves dinosaurs.Also the town hall Museum.Great pics. There really is something for everyone there. It's THE destination for thrill seekers, but there's so much more. Cedar Point is always adding new excitement too. I'm adding Cedar Point to my bucket list. It looks like such great fun! I love amusement parks. I am hoping I get a chance to take our daughter to one before the summer is out. We are moving so not sure it will happen but we are going to try and make it to one. This place looks to be full of fun and giggles. Great pics. That park looks SO fun! I'm a theme park junkie. My boys would totally dig the dino part. We've never been there, but it looks like fun. If we're ever up in Ohio we'll have to visit! My kids would love that! I've only ever gone with my husband but we want to take the kids someday. My husband always has nice things to say about the memories he made there. Maybe one day we will be able to visit with our kids! This place looks super fun! My boys would love it. Great family photos, by the way. I've never been to Cedar Point, but this look fantastic! We could have a family fun day! That looks like a fantastic trip. We did a dino exhibit when we were in NC and we loved it!!! I'm so bummed! We don't have this near us and that Dinosaurs Alive looks incredible! Camp Snoops looks like lots of fun for families with younger children. It looks like there's a lot to do there! I've been wanting to visit Cedar Point for such a long time now - I need to make time to get there! I would love to visit up north to Cedar Point. IT sounds like such a fun place! I have always wanted to go to Cedar Point. It seems like a great long weekend spot. This looks like a fun place to go! The dinosaur area would be a big hit in my family! My kids would so love this. They would like the dinos and the climbing challenge! Wow looks like a great time! I wish we lived closer to some places, my family would love this place! We've never been to Cedar Point. It's not that far from me, so we should totally GO!! Looks like a blast! I think Cedar Point really needs to be on our list of Must Do, since its only six hours away! My son would love those Dinosaurs! That looks like a ton of fun! My kids would love this, especially the dinosaurs. HEY! We were there that day too. The food Cedar Point catered was really good. It would be a great destination for a company retreat or even a family reunion since there is so much more to do than just rides. Getting a FastLane pass is something we'll do next time for hubby and whomever wants to ride the big rides. That'll help us get the best of the whole park for everyone. See- this is more my style! I am not a big coaster fan- but I am a fan of exploring the park with my kiddos! I completely agree! Cedar Point is fun for the whole family. My whole family would enjoy a trip here! I have never been to Cedar Point but have read lots of good posts. It looks like a fun time! I've always wanted to go there. I had no idea they had a whole Snoopy thing happening. Love it! We love Cedar Point...it is such a family fun place! That looks like it would be so fun to go to. I really love all the Snoopy!! Wow, Cedar Point sure looks like a lot of fun. I would love to visit with my family. I have heard of Cedar Point before, but never saw actual pictures. It looks like SO MUCH fun! I have never been to Cedar Point Park, but I think it is on my lifelong bucket list of places to see. I have never been there before. But I do know our family would love it. Ahh, I've always wanted to go to Cedar Point! Thanks for sharing and making me totally jealous. This looks like so much fun! We've never been but I really want to take our kids! Hopefully this summer! 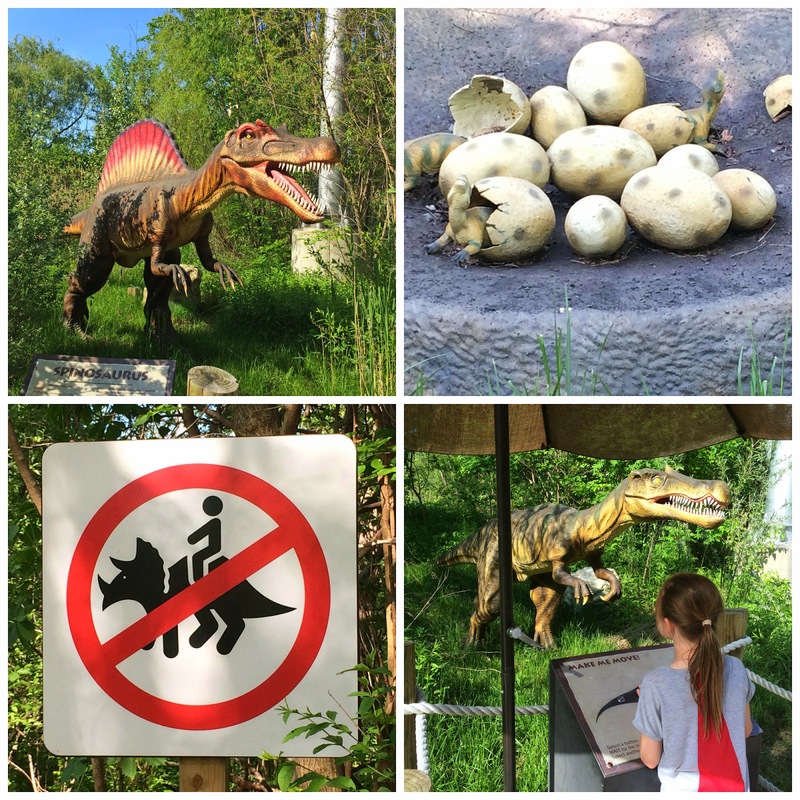 My kids would love the dinosaurs,Those dino eggs are such a fun aid to help kids learn while having fun! You just took me back to my childhood. We used to go to Cedar Point every other year. Of course, it has changed a lot! I used to love that place!